I can’t tell you how many hours I’ve poured into the Civilization computer games over the years. When the mood takes me, I lose days – literal, actual days. Like – spans of twenty four hours. You know, the passage of time. I’m not taking metaphoric days here. I mean I will spend multiples of twenty four individual hours staring at an unfolding virtual empire. I don’t know if I’m making it clear enough as to what I mean here. I suspect there are months in the compressed calendar of my life that simply say ‘property of Sid Meier’ on them. I am at heart a megalomaniac it seems. As such, I approach any new title in this vein with a degree of trepidation – I’m almost forty years old. I’m so old now I can reach out my tongue and taste the grave. I don’t have any more months to give. What little time I have left on this planet has to be spent putting my affairs in order and making my peace with my mortality. I can barely find time to open a board-game in between receiving invitations to funerals. 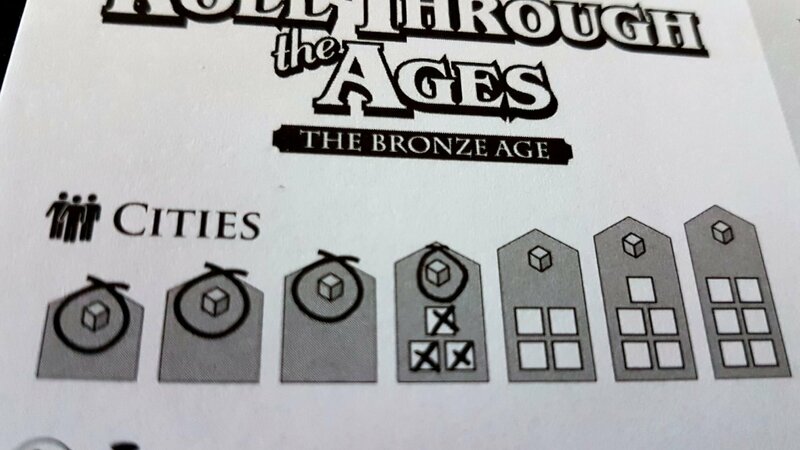 What I’m saying here is that picking up the box of Roll Through the Ages: The Bronze Age was an act of considerable courage and I don’t think I’m going to receive enough kudos for that. 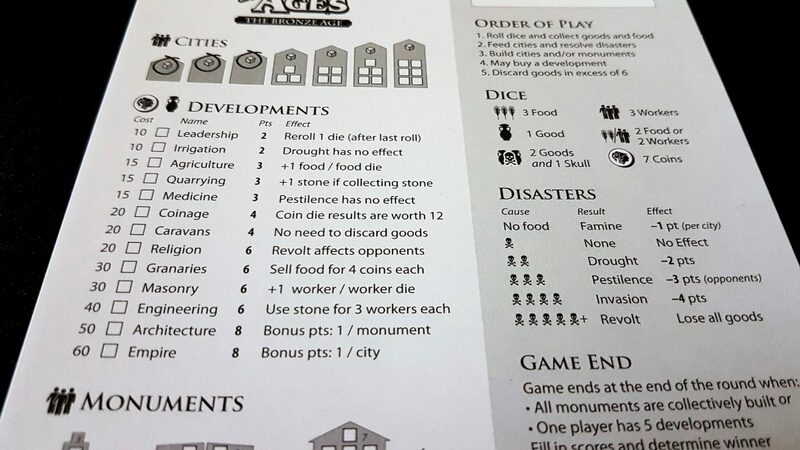 Roll Through the Ages is the most unusual interpretation of a ‘Civ builder’ game I have encountered. Yahtzee style dice rolling is not an engine I would have picked for this style of experience even if I’d had a million years to iterate over mechanical variations. 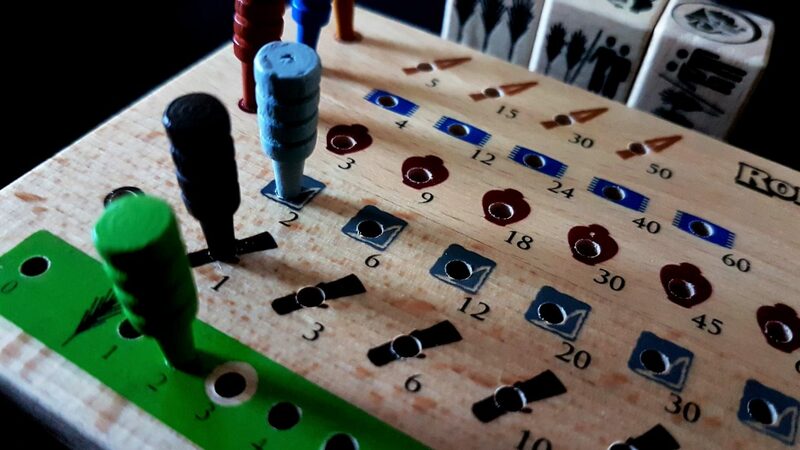 And yet, it works – as weird a choice as it is, it actually does capture a measurable portion of the joy to be found in larger, more complex games in this thematic family. That was surprising, but even more so was the fact that this is game from Matt Leacock – a designer we have gently (but affectionately) mocked on this blog for his slavish devotion to wrinever more droplets of blood from an increasingly desiccated stone. This doesn’t play like a Matt Leacock game at all. It’s not even as if it’s from a dim, dark period in the history of his productive life. He published this game in 2008 – that’s the same year he took the cardboard world by storm with Pandemic. It’s a curio. For many reasons. It feels like a much older game – like something from an earlier era. When you open the box, the first thing you see is a pad of scoring sheets. A very thick pad of scoring sheets. 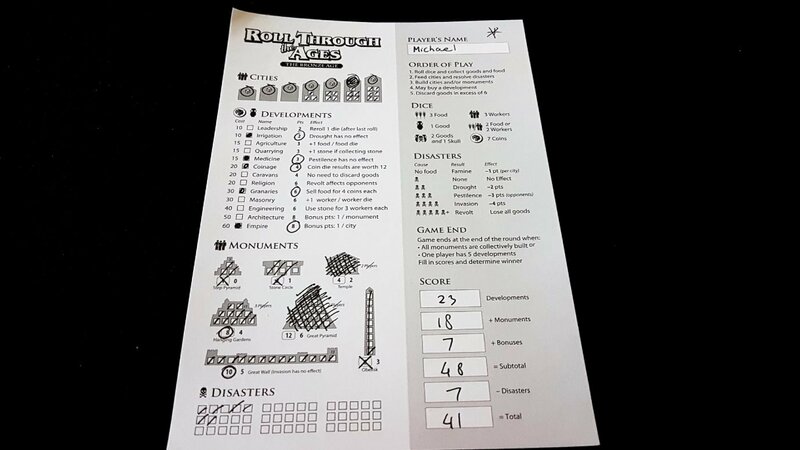 A very thick pad of double sided scoring sheets. A very thick pad of double sided scoring sheet of antique design. It’s a bit like opening the box of the original iPhone only to find it contains two ten-penny pieces and directions to the nearest phone-box. And then the next thing you see is a set of wooden pegboards. Pegboards. 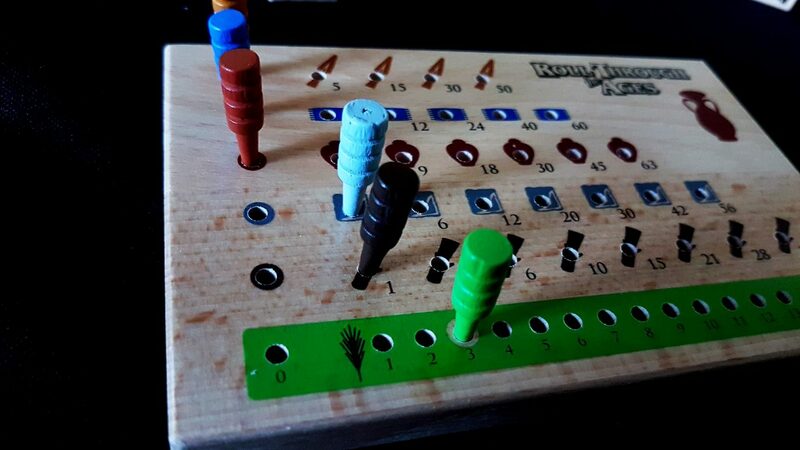 With wooden pegs that you slot in there and move around. The pegboards are thick and heavy, and marked with clumsily printed symbols that implement a design aesthetic from an ancient age. It feels like you’ve got a Victorian educational toy in your hands. And then you get the dice – shorn of the usual smoothed edges and recessed faces. They’re wooden, completely square, and strangely anachronistic. If someone had told me they were found in an ancient Egyptian tomb, I wouldn’t have been at all surprised. Well – I suppose I would have because the game is too cheap to contain priceless artifacts of Pharaonic antiquity. In terms of the way they look and feel though – totally credible. Everything about this game is slightly weird – entirely internally coherent and yet somehow vaguely otherworldly. 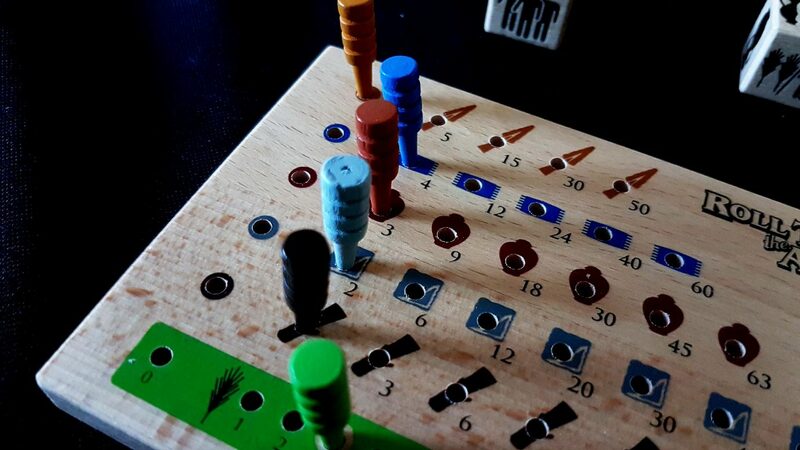 A game that is entirely consistent with contemporary design sensibilities and still somewhat out of time. It’s an odd box. It’s an odd game. What remains to be seen is if it’s a good game. It’s certainly a simple game. Each player takes a score-sheet and writes their name on it. In turn order, they roll dice. 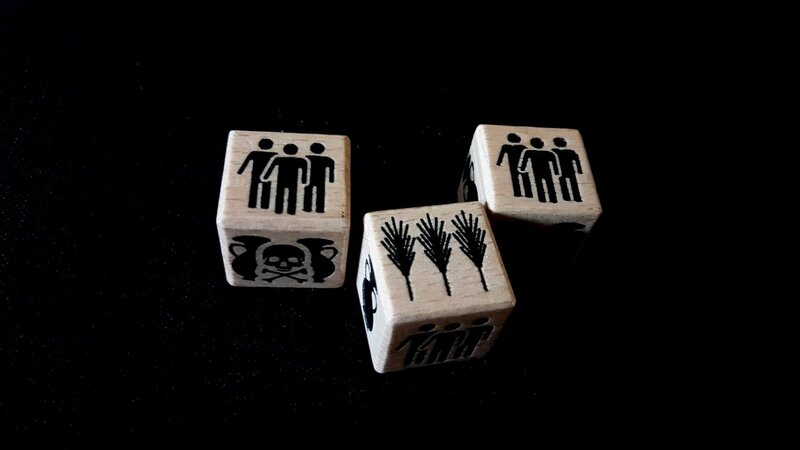 Everyone begins with three dice representing the three cities of their empire. Each city costs a unit of food per turn – the more dice you have, the more food you need to support them. Those dice contain various symbols, and you spend those to upgrade your empire or perhaps sow the seeds of its eventual decline. How you do that is, at least in part, up to you. I’m going to leave it to history to decide on my name. The pegboard we have shows us the resources we have accumulated for our civilization. These are in stored food, and in raw or processed goods. The food we can use to provide a buffer for lean winters. The goods we can spend on developments. 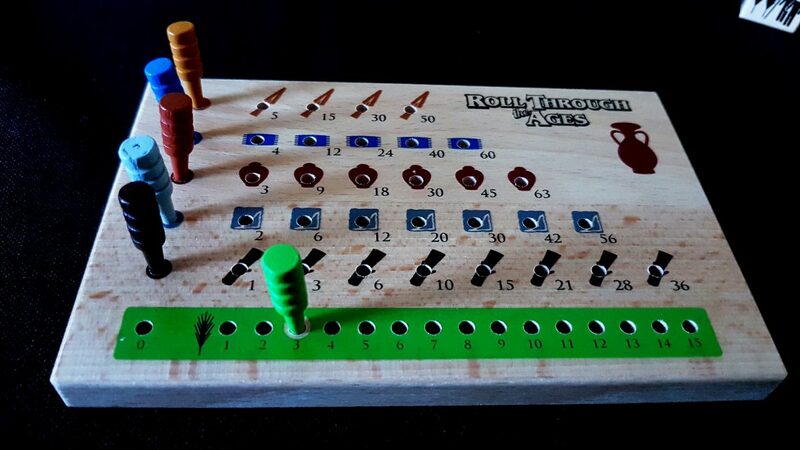 Roll Through the Ages comes with a simple technology system that permits us to buy advantage. If someone buys five developments, the game is over. We can buy these developments either by selling goods, or by rolling coins. Rolling a coin is worth seven to begin with but if we invest in coinage as a development each coin we roll will give us a cool twelve money to spend in future turns. Goods we accumulate by rolling either good symbols, or the more troublesome ‘two goods and a skull’. Like in Yahtzee, we get a chance to reroll dice in Roll Through the Ages – three rolls in total, keeping whatever faces we want. If we roll a skull, we don’t get to reroll that die. If we roll multiple skulls in our turn it means bad things happen. Usually they happen to us. Sometimes they happen to our opponents. Skulls represent ‘interesting times’, and while they can be a problem they also tend to make civilizations rich as they profit off the catastrophe. Coins are useful, but first a civilization must eat – we begin with three cities worth of food in our granaries. Every time we must feed a city and can’t, we lose a point in the end-game scoring. 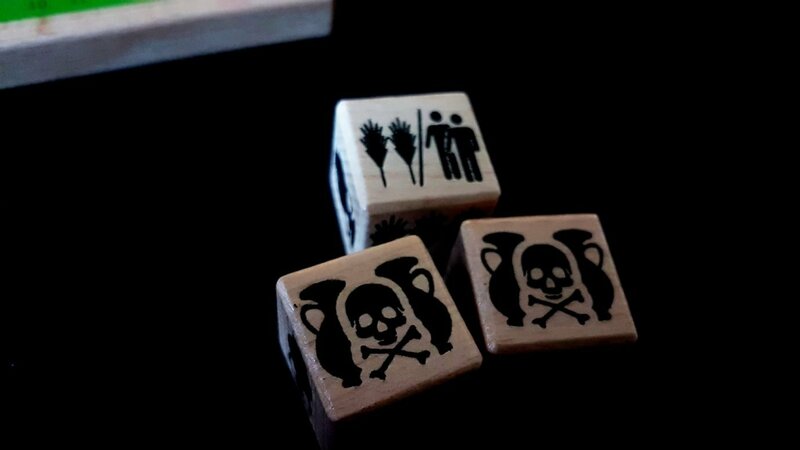 Balancing food versus dice is an important part of developing your empire’s aims. The last thing that we might roll on a die are workers and these are the backbone of our growth. While goods and coins buy technology, workers buy us fertility and legacy. We use them to build new cities, or break ground on the awe-inspiring monuments that will solidify our reputation as a premier bronze age civilization. 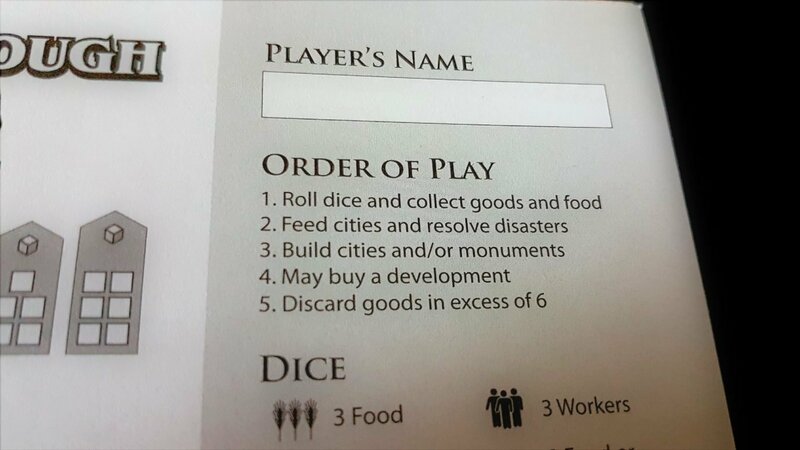 Some dice let us choose workers or food. Others are more restricted, but also more generous in the allocation. Meat’s back on the menu! Once we’ve rolled the dice we want (and can), we need to work out what happens. Two skulls mean a drought, and a drought is a two point penalty to our empire. The more skulls we roll, the more epic the disasters that are visited as a result. 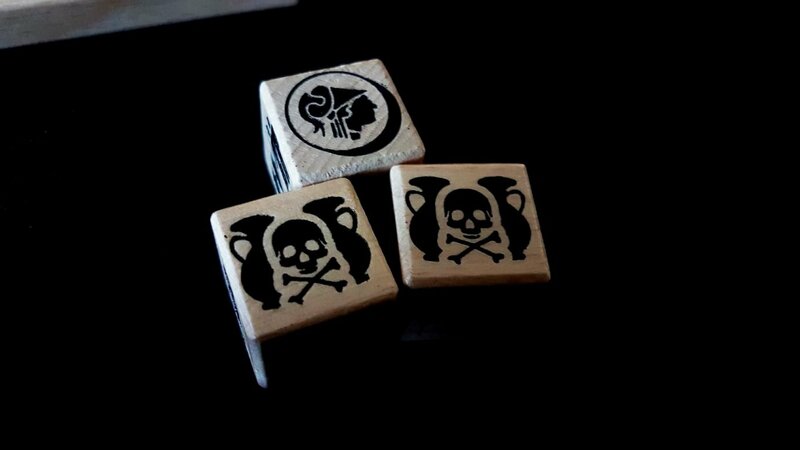 Interestingly, three skulls means disaster for your opponents so if you have two skulls there is little to discourage you rolling for a third. Each time a disaster visits us, we mark it off on our score-sheet. As time goes by this becomes a kind of ledger of misery – a scratchpad abacus onto which you record the woes of the generations. It records triumphs, sure – but it also prominently reflects your failures as a ruler. Rock hard. Because it’s stone. If we had rolled six or more goods, we’d move each peg up once and start from the bottom once more. 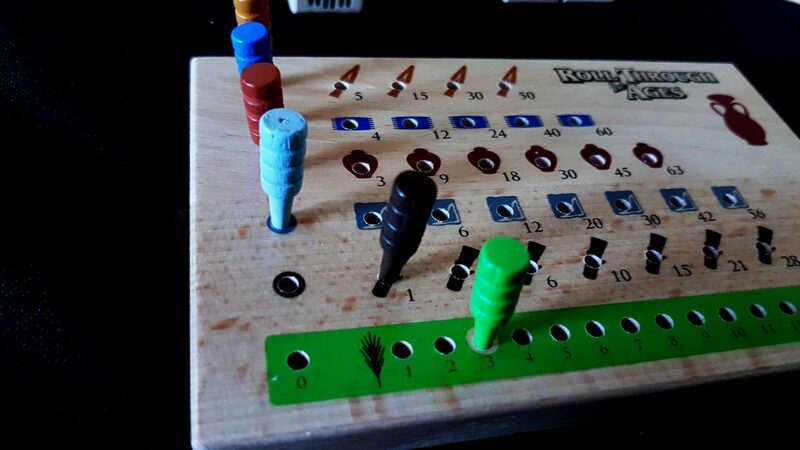 The bottom most peg represents wood – cheaply available and easily gathered. Stone is the next row, followed by pottery, cloth and spearheads. The value of your accumulated stores increases exponentially the more you have but your empire is only capable, at least initially, of storing six goods at once. The more processed the goods are, the more quickly their value accumulates and the more efficiently they can be turned into coinage for the purchase of developments. Except… not really. When you spend goods, you don’t just spend them in the values shown on the pegboard. If you are selling stone, you’re selling all your stone. If you’re selling wood, all of it is going away. You can’t make change in Roll Through the Ages. Selling goods to buy a development is an exercise in efficiency of allocation – it makes you loathe to waste a single penny. With one each of wood, stone, pottery and cloth a player can cash the lot in for ten coins and use that to purchase a development – remember, the first player to buy five developments triggers the end-game so you don’t want to be too free with your funding. Ten coins though is enough to buy irrigation, which inoculates a player against the disastrous impact of drought in the future. There are reasons, rather than mere victory chasing, to purchase developments. You need to weigh up the risk of hoarding versus the benefit of spending. Developments give benefits, but they are also worth points. Those points will sum up at the end of the game to tell us who won – the more expensive a development, the more points it’s worth. If history has taught us anything though it’s that the smartest civilization is not necessarily the one that will prosper. Sometimes we remember civilizations merely because they had great public relations departments. 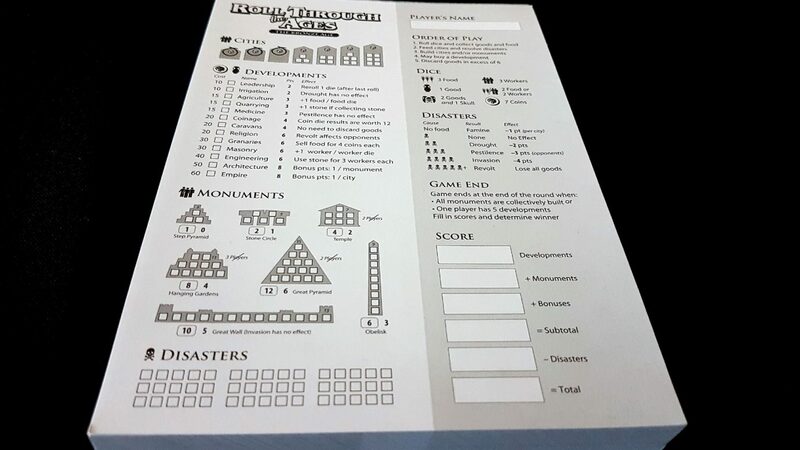 Another three might be spent to begin work on a great monument – the first person to construct one of these earns the lion’s share of points at the end of the game. When all the monuments in play have been built, the game is over. Only one monument has a special power to go with it (the great wall prevents invasions), but they do come with a heavy allocation of points. You simply throw workers at them until they’re completed, and then count up the prestige once you’ve disposed of the bodies. And that’s it – that’s the game. Every turn you roll your dice, feed your people, and expand your empire. Balancing growth versus sustainability versus prestige is the constant challenge at the heart of play and there is real risk in over-stretching yourself. 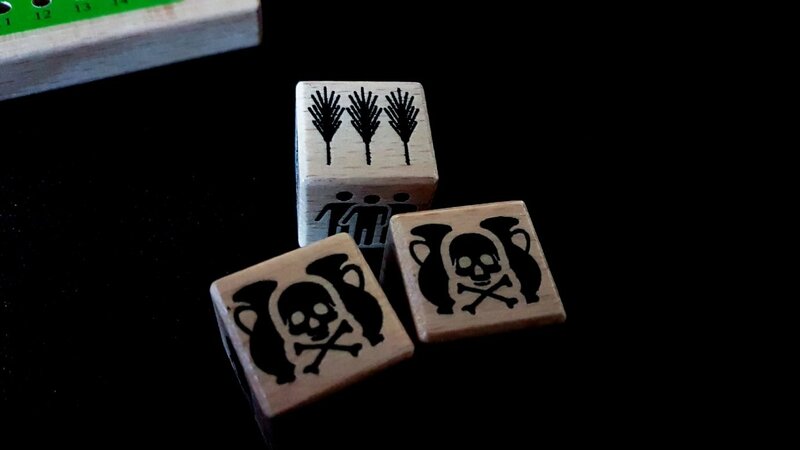 Seven cities means seven dice, but seven dice mean a lot of skulls along with a pressing need for food every turn. Three cities means manageable risk but severely curtailed aspirations. Aiming for food lets you build up a buffer, but goods potentially let you buy the developments that make it less necessary. You can invest in your agricultural base, or your commercial power. You can line things up so that your agriculture feeds into your granaries, allowing you to turn every food die into sixteen precious coins. Or maybe you’ll go for quarrying to beef up your stone collection and then couple that to engineering to supercharge your construction base. And then there’s your strategy for victory – are you going to go for a lot of cities along with the Empire development? That’ll give you a hefty fifteen points if you have all seven cities at the end. Or maybe you want to become monument builders, coupling architecture to an aggressive agenda of civic aggrandizement? While what I do doesn’t often meaningfully impact on your civilization, there are disincentives to all players attempting to chase the same goals. This is from a game session from which I don’t remember a single thing. It’s definitely a game that works and I wouldn’t have expected that if someone had given me an elevator pitch. There are meaningful choices in the way you develop your civilization and enough agency turn to turn to feel like you’re constructing something of worth. It’s doesn’t have the heft of ‘real’ civ builder games but it’s not trying to go head to head with any of the meatier titles in this family. But that illuminates the key problem with the game – it’s profoundly limited. We played this several times, and then I played it a couple of times solo, and beyond the first couple of plays I never really felt like I was getting anything new out of the experience. There are different strategies you can adopt, but they all feel very similar – all that changes is what dice you’re hoping to roll. Aiming to become the largest empire is eerily similar to doubling down on wonders, which feels very much like winning the tech race. Civilization games tend to be epic and varied and reflective of human diversity. 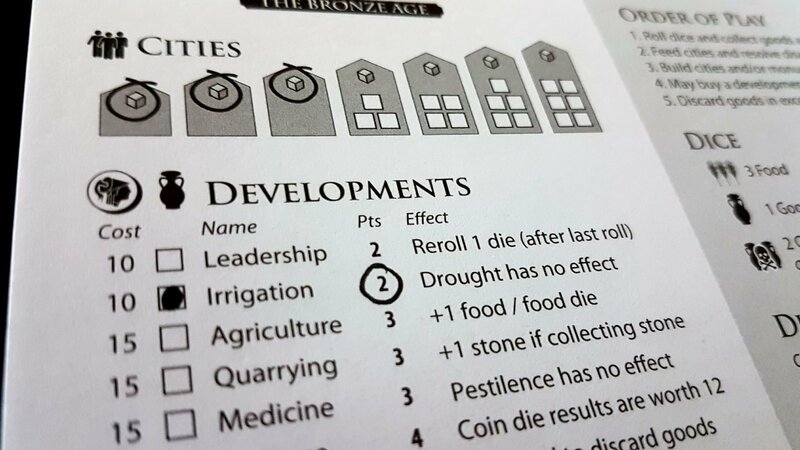 Roll Through the Ages is the Groundhog Day implementation of that concept. More than this though, the game is so short and the scope so limited that it ends up feeling frustrating. You start to develop an empire and just as you feel it has a little personality the game is over. Just as soon as you settle in to your shiny new throne you’re being evicted from the palace. What efforts you make to shape your society end up just putting an expiration date on it. I am Ozymandias, King of Kings. These need not be critical problems in a game that is after all attempting to give the flavour of empire building with only a fraction of the ingredients. However, this is a genre that thrives in development and diversification over the long term. Roll Through the Ages just doesn’t have that in any real sense. I don’t feel pride or ownership in my civilization because it never feels like mine. At the end of a marathon game of Civilization I can reflect upon a rich and textured history, full of wars and disasters and triumphs and disappointments. I remember when I allied with France only to betray them as Greece and I smashed them against the sea. 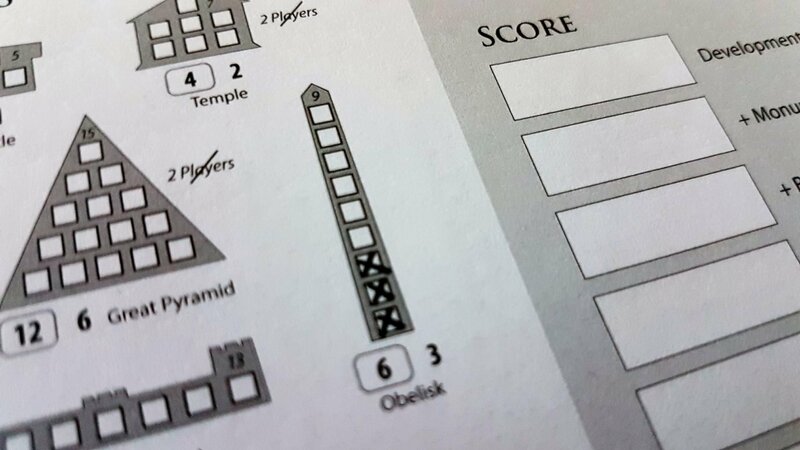 I can fume over how I lost the Great Pyramid to a more industrious ruler. I can remember the way my richest port city changed hands a half-dozen times over the course of the slow centuries. I look over a session of Roll Through the Ages and I can reflect upon a score-sheet etched with utterly empty notches. It just doesn’t give me what I want from a civilization game, and I don’t think it ever can. So, you need to view it in that light – it’s not really a civ game. It’s Yahtzee with a few interesting twists. Those twists make it worth playing, but they’re not interesting enough to make it worth replaying. Having played Roll Through The Ages often enough to be comfortable in reviewing it I’m not sure I ever need to play it ever again. There is nothing more for me to find in its mechanics. 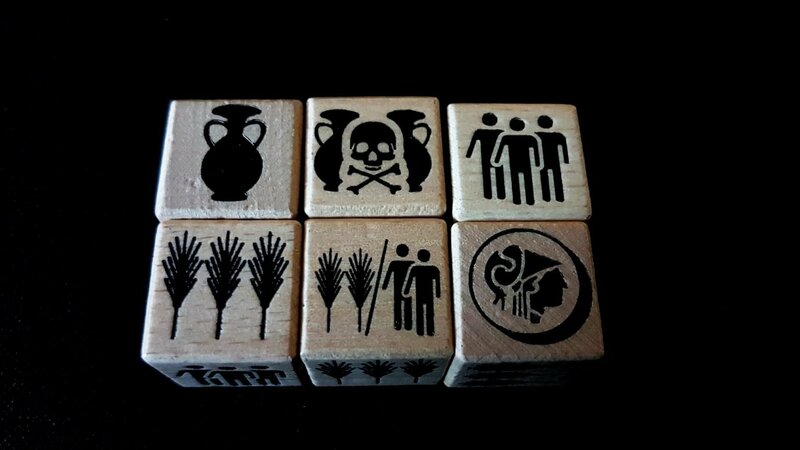 I found Roll Through the Ages a game of bricks and left it – well, still a game of bricks. Additional playthroughs of this would be utterly unnecessary and that’s the worst attribute I can imagine for a game about civilization building. 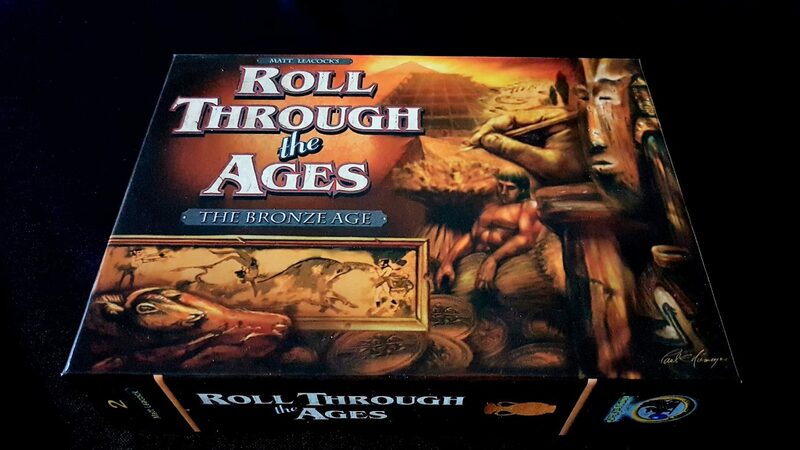 Roll Through The Ages is built around an interesting idea. A worthy idea. A well-executed idea. And I wouldn’t feel a moment’s loss if I never played it again.